Definition at line 36 of file CQProgressItem.h. Definition at line 27 of file CQProgressItem.cpp. Definition at line 37 of file CQProgressItem.cpp. 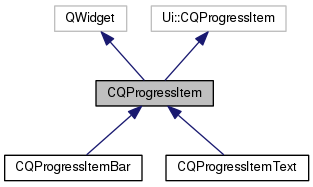 Reimplemented in CQProgressItemBar, and CQProgressItemText. Definition at line 43 of file CQProgressItem.cpp. Definition at line 46 of file CQProgressItem.cpp. Definition at line 49 of file CQProgressItem.cpp. Definition at line 49 of file CQProgressItem.h. Referenced by CQProgressItemBar::destroy(), CQProgressItemBar::init(), CQProgressItemText::initFromProcessReportItem(), CQProgressItemBar::initFromProcessReportItem(), CQProgressItemText::reset(), CQProgressItemBar::reset(), and ~CQProgressItem().